Melati Ahmad is a sixteen-year-old Malaysian girl of Malay descent who suffers from Obsessive Compulsive Disorder (OCD)—however, Melati believes that her OCD is actually the work of a djinn. Since the death of her father, Melati’s greatest fear has been the death of her mother. She counts by threes—her compulsive behavior—to appease the djinn and save her mother, along with everyone else she loves, from dying. On May 13, 1969, Melati is thrown into a world of chaos when the race riots between the Chinese and Malays begin. While at the movies with her best friend Saf, men with weapons break into the theater. Although Melati is saved by a Chinese-Malaysian stranger, she is forced to leave Saf behind if she wants to survive. Overcome with guilt, Mel teams up with Auntie Bee’s son Vince to try and find her mother who see she has not seen since the beginning of the riots. Melati is forced to confront her djinn and find her inner strength in order to stand up for what she believes in, find her mother, and protect the people she loves. Alkaf is unafraid to make a book that is completely and utterly of her homeland. Alkaf’s note at the beginning of the book is spot on, letting readers know of the many possible triggers within the book and lets readers know that it is okay if they are not ready to read the book at this time. This is a powerful and brutally honest book that provides a very real look at what OCD looks like in a high-stress situation, which help builds the tension within the book. It is thoughtfully and beautifully written, vividly capturing a time of terror from the eyes of a teenaged girl who just wants her mother. Posted in 9-10, community, death, identity, Simon and Schuster, Uncategorized. As per tradition, when the land of Honoku needs a new empress, a competition is held. All eligible women are invited, and the one who survives each of the four enchanted seasonal rooms is deemed worthy of the title of Empress of Honoku and position next to Taro, the prince next in line to be emperor. Mari has trained for this competition since childhood, though as yōkai she is technically ineligible to compete. Yōkai, supernatural beings, are under threat and enslaved by the current emperor. But Mari cares little about the rules or the prince – she competes for the power of being empress, and to bring change to Honoku from within. Taro himself doesn’t enjoy being a prize to be won, and cares little about his power – he would rather spend time in his lab with his mechanical inventions. Akira, another yōkai and friend of Mari, works to overthrow the Emperor from the outside while Mari keeps her true identity hidden to join the competition. Taro may just become their greatest ally, if they can learn to trust each other when their identities and motivations are revealed. A detailed world and political structure along with multiple perspectives gives this fantasy novel depth and puts the reader at the immediacy of the action. Inspired by her Japanese heritage, Jean has created an escape for readers that questions the sacrifices made for duty and love, and challenges the notion of tradition as a value to be upheld. Langston doesn’t like much about his new life in Chicago – not the small apartment he shares with his father, or the noisy streets and sidewalks, and definitely not his new school, where classmates call him “country boy” and make fun of how he speaks. Langston misses Alabama, where his mother died and where his Grandma still lives, though his father sends her part of his paycheck each week in the hopes of helping her move up north with them. It’s only when Langston discovers George Cleveland Hall Library, open to all Chicago residents, that he starts to feel at home. In the safety of the library, Langston also discovers his namesake, a poet who seems to have inspired a few of the love letters written by young Langston’s mother to his father. Reading the poetry of Hughes helps Langston work through his grief at losing his mother, but it’s a new friend who recognizes that reading poetry “is a way of putting all the things you feel inside on the outside” (p 99). Cline-Ransome mixes poetry and history in this slim fiction novel for elementary and middle school children. The post World War II era of the Great Migration is explored through the story of one family, and Langston (the character) also learns a great deal about Langston Hughes and other African American poets and writers of the time. Chicago’s Bronzeville neighborhood and Chicago Public Library’s Hall Branch are both highlighted and given extra detail in an Author’s Note at the end of the book. Told with heart and thoughtfulness, Finding Langston belongs in personal libraries and on classroom shelves alike. Though I pay for it in the morning, lately I have happily been staying up way too late reading. And while I’m making an admirable dent in my to-read list, my to-be-reviewed list is getting longer and longer and longer! So instead, here is a list of some of the powerful, sweet, funny, and very-highly recommended #ownvoices MG and YA titles I have read (and LOVED!) this spring. Check them out and judge for yourself! Amal’s dreams of becoming a teacher are interrupted by an accident that lands her as the indentured servant of a cruel and corrupt landlord. She must learn to work with the other unhappy inhabitants of his household to expose the truth of his misdeeds and return to her family. As a descendant of the maji, Zélie will use the power of family, will, and the magic of her clan to fight a brutal and oppressive monarchy bent on destroying her people, and magic, forever. Abandoned by her mother and bullied by nearly everyone else, Caroline finds comfort in a new classmate—Kalinda. She will fight her community, her emotions, and Mother Nature herself to find her mother and save her friendship. When a school suspension sends Marcus, his mother and brother to Puerto Rico to “hit the reset button,” his mishap-filled search for his father helps him discover that fatherhood and family can look different than he ever imagined. Two inquisitive kids spend the summer solving a mystery from the past, facing racism then and now, in a small South Carolina town that hides both terrible secrets of racial violence and a multi-million dollar treasure. So until the next list (picture books, maybe? )… Here’s to late nights with a good book and early mornings with a big cup of coffee! These days, it’s more important than ever for us to share stories about immigration with the young readers we serve; both for the sake of immigrant kids in our communities, and to encourage understanding among others of these kids’ experiences. Join us on April 5, 2017 in the Butler Center from 5:30-7:00 (books & snacks out at 5:30; discussion from 6-7) to discuss the following list of recently published books with an immigration theme, from picture books to children’s fiction to teen fiction. We’re focusing on fiction this time; we know there are lots of excellent informational books too. You may remember the Butler Center’s “Big Read” bibliography from last year; this month’s list complements the selections recommended there. Posted in 1-2, 11-12, 3-4, 5-6, 7-8, 9-10, Candlewick, Charlesbridge, community, empathy, HarperCollins, identity, Lee and Low, Penguin Random House, Simon and Schuster. It gets to be this time of the year in the children’s publishing world and my anxiety starts to bubble to the surface of my being. Blogs are buzzing with reviews of novels, analysis of illustrations, and comparison of genres. Librarians ask each other, “What are your favorites this year?” Patrons ask, “So who do you think is going to win?” And while I love love love the ALSC awards, I want to take a step back and reflect upon what a few of these buzzing books have in common, rather than the spirit of competition that my air bubble is currently filled with. This perfectly fits with The Butler Center’s mission to encourage imagination and wonder through literature. Okay, so let’s the get obvious ones out of the way– most of these authors are women and they are all fiction choices. But this says more about me as a reader than about the Newbery contenders this year. 1) They all ask important questions. Why are we here? How do I discover my own voice? What is the best way to make decisions? Where do I fit in? Can I change my own destiny, or is it just up to luck? Whether it is Georgie who is trying to navigate her own world amidst feelings of loss and coming-of-age discoveries or Flora going on adventures with a magic squirrel, these characters search, seek, and only sometimes find the answer. In other words, they make us think. 2) They are filled with important relationships. 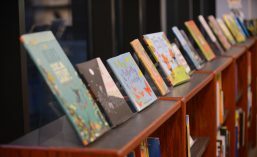 I think we know that humans instinctually want to connect with others, but each of these books explores friendship and family relationships with distinguished and dynamic depth. Cady searches for her long-lost parent. Willow loses everything she has and then finds family in a patchwork quilt of interesting human beings. The ghost of Jacob Grimm protects young Jacob Johnson Johnson, forming a kind of intimate bond between male characters. This level of authenticity is, in my opinion, rare in middle grade/YA novels. 3) They leave us with more questions, rather than answers. These books don’t tell us the way to live. There is no black and white, right or wrong. They explore questions along the way, but they leave the answers up to the reader. And isn’t that what great books are all about? Some of the best books I’ve read, I’ve finished the last page and thought, “Hmmm,” or “….huh…. ?” But then I think. I talk to other readers. I wait for it to sink in. And all of these books have sunk in because they don’t “fix” or “solve” anything. They explore, ignite, and wonder. What Newbery buzz books are you excited about this year? What do they have in common with each other? How do the books inform each other when you compare them in the aggregate rather than in direct competition with each other?